We had a good response to our call-out for yesterday. Around 150 antifascists, including a lively sound system, came together from Elephant & Castle to confront fascists at Downing Street. It was a great pity that we had to overcome Unite Against Fascism’s police-organised caged pen to block the EDL from getting to their desired position in Whitehall. We didn’t defeat the fascists but we did disrupt their planned demo hinder their progress to Downing Street. Comrogues should be congratulated and proud of this. However we were vastly outnumbered by the police and the non-uniformed fascists. There are reports ranging from 1000 to 3000 EDL members. Our side had possibly 500-700 at best and it petered out quickly. The “black bloc” appeared to be the largest group but we cannot confirm this at this stage. Our anti-fascism is critical of the type of “anti-fascism”, that relies on co-operation/collaboration with the police. We witnessed police officers punching the faces of female activists, and attempted to arrest one Asian female activist for “unladylike” swearing while at the same time fascists could make Nazi salutes at a World War Two memorial unhindered. Unsurprisingly the police protected the fascists and trapped us in a kettle when English Defence League members threw glass bottles and other missiles against into a crowd with children and activists with mobility problems. This was not a victory and we need to learn from the horrific experiences many on our side sadly faced. Some activists were trapped between the two blocs and got assaulted by both the police and the EDL. Kevin Carroll, Tommy Robinson’s idiotic second-in-command, while wearing a black shirt goaded antifascists to hit him and he was able to speak with police protection. The EDL may not be growing at the pace some had feared but they have a stronger momentum than UAF or the antifascism of our traditions. We must organise with others to build maximum effective opposition. 1) Nick Griffin has appealed to all fellow travelers to attend the British National Party march and motorcade from Woolwich Barracks to Lewisham Islamic Centre on Saturday 1st June from 12pm. They are distributing leaflets locally to prepare. 3) We are aware of other events that we won’t communicate here. This Saturday, we must be stop the fascists from marching to Lewisham, from attacking Islamic centres and mosques. We won’t “cheer up”, this week we will be holding a planning meeting, knocking on doors, visiting local Islamic centres and mosques to organise against the scum that dare to intimidate our communities and darken our streets. NO PASARAN! You confuse the EDL with the BNP. The BNP are a racist organisation but the EDL are an anti-Islamist organisation. I say ‘organisation’, really they are just football hooligans operating in the closed season! The thing that you need to recognize is that Islam is a fascist religion and to protest against people protesting against fascism is pretty pointless. 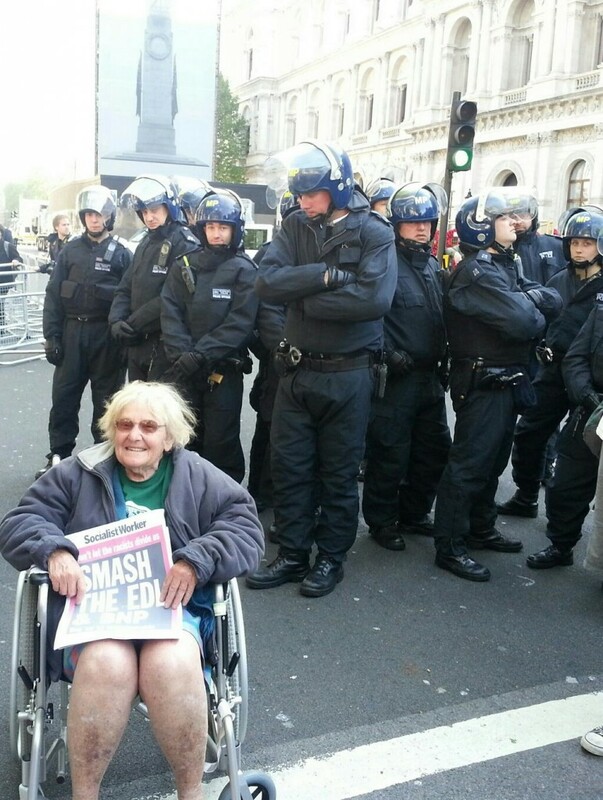 You really need to understand the thing the EDL is protesting about. Muhammad is the messenger of Allah. And those with him are hard against the disbelievers and merciful among themselvesâ€¦ (48:29) Perfect Fascism. Fight those who believe not in Allah nor the Last Day, nor hold that forbidden which hath been forbidden by Allah and His Messenger, nor acknowledge the religion of Truth, (even if they are) of the People of the Book, until they pay the Jizya with willing submission, and feel themselves subdued. (9:29) Fight and terrorize the Non-Muslims until they submit. Most Muslims do not follow Islam to the letter but those who do commit terrible acts. 15 â€œBeware of false prophets, who come to you in sheepâ€™s clothing, but inwardly they are ravenous wolves. 16 You will know them by their fruits. Do men gather grapes from thornbushes or figs from thistles? 17 Even so, every good tree bears good fruit, but a bad tree bears bad fruit. 18 A good tree cannot bear bad fruit, nor can a bad tree bear good fruit. 19 Every tree that does not bear good fruit is cut down and thrown into the fire. 20 Therefore by their fruits you will know them.